Lucas Young advises those in the healthcare industry on a wide range of transactional issues and protects their interests in litigation. He has assisted with acquisition agreements and commercial contracting issues as well as complex litigation relating to Medicaid and general federal healthcare program requirements. With experience that includes discovery, drafting complaints, pleadings and motions, Lucas is involved in all phases of litigation. He is committed to working with his clients so they are informed throughout the process from intake to resolution. Prior to joining Hinshaw, Lucas was an attorney at a Peoria-based firm where he maintained a broad litigation practice and also assisted clients in a variety of transactional matters. 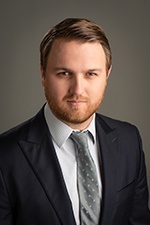 During law school, Lucas honed his skills in litigation and concentrated his studies in healthcare, corporate law, employee benefits and pensions. As a legal intern for the Executive Office of Health and Human Services, General Counsel's Office in Boston, he assisted on complex litigation arising out of the Commonwealth's Medicaid program. Lucas was also a law clerk for the Honorable Mary Dacey White, Massachusetts District Court, Brookline District Court. In his free time, Lucas enjoys playing golf, spending time with his wife Julie—and their Golden Retriever, Teddy—and participating in competitive fishing tournaments.